I am having trouble completing my order. Can you help me? Your machine does not allow cookies. The website needs to place a cookie on your machine to open, otherwise it won’t be able to process your order. Your firewall is preventing the opening of the relevant part of our website. To test this, switch your firewall off and attempt to purchase. This is the most common cause of all problems. After you have made your purchase, remember to switch your firewall back on again. You may have a ‘pop up stopper’ preventing the correct window required to make a purchase from opening. Switch the pop up stopper off and try to make the purchase again. Please note that if you are using Mozilla or the Google toolbar these have a default pop up stopper. Programs such as Nortons Security Suite will automatically block the loading of secure sites. You will have to either disengage it, or try adding www.tradinggame.com.au to the list of trusted sites within this software. The internet security setting of your browser may be set too high. It is recommended that if you are using IE6 as a browser that your security settings be set to medium. This is adequate for the majority of corporate and personal users, so it should be fine to leave this as your default setting in the future. You may have downloaded Windows XP Service Pack 2. This product contains both a firewall as well as a pop up stopper, and the latter will impede your ability to place an order with the Trading Game site. To order from our site you will need to configure the ‘pop up’ blocker and place your order. 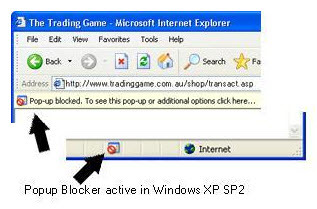 You will need to add www.tradinggame.com.au to your trusted sites list within this software as this will also prevent you from accessing the Trading Game Forum. or a fax (03 8080 1655) listing your full name, address, phone number and credit card details, and we will be happy to process your order. Any cheques that have not been written for the correct amount, including the 10% cheque surcharge, will be returned to the recipient. By far the least expensive method of ordering via this site is to use a credit card, and for these details to be processed electronically. A secure link is provided for this purpose. as soon as you’ve made the deposit, and let us know what you’ve ordered, and your full mailing address details and phone number. We stand by our products, and we know that when you see the quality and value for money, you’ll realise that your trading goals will be fulfilled by this education. If however, you are unhappy for any reason, books, posters and home study courses may be returned within 10 days of purchase. Keep in mind that we will be unable to refund postage as all postage will remain the responsibility of the person ordering the product. To be refunded, products must be returned in saleable condition. Keep in mind that any refunds will be put on as a ‘credit’ to your credit card, if this is how you initially paid for the item. Unfortunately, we are unable to provide refunds for PDF files, MS Excel files, or other electronic media purchased from The Trading Game. This is due to the lack of copyright security available for this type of media. We’re sure you understand where we are coming from with this, as this is standard policy for all companies, even outside this industry, when dealing with these types of items. The following charges apply for items purchased through the Trading Game online shop. Single items are charged at Cost per Item as shown below. Orders of 2 or more items are charged at Max. Cost per Order as shown below (there is no limit on the number of items you can include in your order – this is your maximum delivery cost for items ordered at the same time). Please note – you may be required to pay customs duties and taxes once a shipment reaches your country. For further details please contact your local customs office. Some products such as the DVDs and Home Study Courses have a different freight costing which will be indicated in the product description. Products may be sent from different locations (e.g. books from one location, and posters from another), so they may arrive in different packages and at different times. If this is the case, you will still only pay one postage fee. What do the rankings mean for the shop items? These products and courses are designed especially for people who are new to the sharemarket arena. They will also be helpful to traders with up to 12 months experience as well as those looking to review some of the building blocks that develop successful trading habits. These products and courses are designed especially for people who have already begun trading and are looking to refine their skills and knowledge. At least 6 months of trading experience is suggested to derive the greatest benefit, although traders with less experience are welcome to use these resources to introduce them to more developed concepts. These products and courses are designed for people who are actively trading and have gained a practical understanding of many of the basics. If you’re ready to implement more advanced strategies to add a new level of development to your trading, these products will suit you. Programs such as Nortons Security Suite will automatically block the loading of secure sites. You will have to either disengage it , or try adding www.tradinggame.com.au to the list of trusted sites within this software. The internet security setting of your browser may be set too high. As soon as you’ve made the deposit, and let us know what you’ve ordered, along with your full mailing address details and phone number. We stand by our products, and we know that when you see the quality and value for money, you’ll realise that your trading goals will be fulfilled by this education. If you are unhappy for any reason, books, posters and home study courses may be returned within 10 days of purchase. Any refunds made will not include postage. Any refund balances will be credited to your credit card account where your credit card was used to initially purchase goods. All other refunds will be made via eft to your nominated bank account. Delivery is via Australia Post. All items include GST (Goods and Services Tax) if purchased within Australia. If purchased from an address outside Australia, GST will not be added to the resource you’re purchasing. If ordering from outside Australia, please note – you may be required to pay customs duties and taxes once a shipment reaches your country. For further details please contact your local customs office. These products and courses are designed especially for people who have already begun trading and are looking to refine their skills and knowledge. At least 6 months of trading experience is suggested to derive the greatest benefit. Traders with less experience are welcome to use these resources to introduce them to more developed concepts.